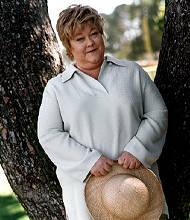 Kathy Kinney was born in Stevens Point, Wisconsin on the third day of November 1954. She is the only child of Marian and Harold Kinney. She grew up in an Irish American household in the same town in which she was born. Kathy still visits her mother once a year (who sitll lives in Stevens Point). Although Kathy is from the cheese capital of the USA, she is highly lactose intolerant. She must have developed this condition later in life because Kathy recalls having dairy with dinner. A typical Tuesday night dinner at the Kinney household including "Meat loaf! With cheese on it. Because it is Wisconsin.. . . . And two small glasses of milk. . " She said in an interview. Her Mother gave her two small glasses because her was afraid her Daughter would spill. Around the age of 15, Kathy helped her father, Harold because he was dying of emphysema. "[She] had to learn how to do things that a boy would do because [her] father couldn't breathe". After her fathers death her Mother urged her to take the Social Security money aquired from her dad's death to start school. She went to the University of Wisconsin to become a licensed practical nurse. She says she wouldn't be an actress now if her father was still alive. To handle her fathers death, she says, she would put on a tool belt and built sets for school plays. She felt she could hide in this type of work. And because she helped her Father around the house, she was good at it. Kathy was cast in a secondary role when a summer production of The Boyfriend had a shortage of actors. And as a rusult Kinney was cast. Kinney struggled at first when, the entire cast had to dance the Charleston during a curtain call. "When I finally did get it right, I was so happy everyone thought it was a [comedy] bit." This is when Kinney came upon something special. Comedy! Before she graced our presents on the stage, large screen and small screen she graced other's in Stevens Point as a Waitress. This job lasted about five minutes. The first and last customer she served couldn't eat the meal she served him because how could anyone eat a sandwich from their lap (Don't answer that question)? I bet now she longs for the episode where she serves Drew Carey in the same manner while spouting. "Eat this pig." From the waitress gig she was demoted to "Cabin Girl". Another job was "The girl that painted the cabins" (which she was demoted to after being cabin girl). She also worked as a bar tender. The job was in a converted lumberjack housing area which mostly served collage students (who sometimes drink like lumberjacks). When she moved to New York she didn't continue her gin mill gig. Because the young lumberjack drinker's drinking eloquence included "A beer and a shot." As Kathy states. "But usually it was just a beer or just a shot." New York, to Kathy, shone brighter than University. So in 1976, at the age of 23 with only $80.00 to her name, Kathy moved to The Big Apple. She worked as a secretary for a boss who liked to hunt. Sometimes she would chat with him in his office about the hunt. She would often say "So. Did you kill anything this week?" This is where, Kathy says"Mini Bobek" was born. At this same time she tryed her hand at improvisational comedy. She also started teaching improv classes. One such class had in its attendance a director by the name of Bill Sherwood. Bill Sherwood wrote a part for her in his 1986 film, "Parting Glances,". When the film came out Kathy went to visit friends in Los Angeles. She didn't return to New York. "My agent was sending me out for these fierce roles," she says, "but I was so fragile that I never could quite get it. I lost a lot of jobs trying to be what I thought they wanted me to be. It wasn't until I became comfortable as me that I started getting all these serial-killer kinds of jobs." She played a murderess on Good and Evil, short-lived sitcom in 1991. She was also a mad bomber on Dream On. And was the colorful town librarian on Newhart. 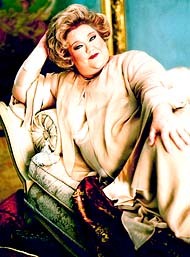 Kathy avoided the auditionis for what she calls "the heavy-girl roles,". Critics occasional grumble that her character 'Mimi' is a waddling fat joke. But her weight has never seemed to be the point of a fat joke. "One time I had to say to Drew, 'Aw, you're just fat,' as the ultimate put-down. I personally don't like it, but if fat jokes slip in because they're funny, I don't care." She is, however, less comfortable about being typed cased because of her weight. "Once in a while I would lose some weight, just by accident, and someone would say to me, 'You're going to diet yourself out of a career,'" she says. "And I tell them, 'I'm losing weight, not my talent.' Why is it the first thing [some people] look at is the shape? It points up to me the prejudice that still exists." The character, Mimi, has been an extreamlly dominant force in the life of Kinney that she has had few opportunities to meet anyone she would consider dating. "The only men I've met in the past year were reporters or cameramen from Entertainment Tonight," she says. She also isn't worried about the burn out of short lived careers of other actors. The ones who've played indelible roles on TV. Kathy has a strategy. "Oh yeah," she says, holding out a make-believe mirror. "It's called washing my face."